The other day my sister asked me how I put a binding on my quilt. As I tried to describe my technique in words, I realized that pictures might do a better job. So I tried to take pictures each step of the way on my latest quilt binding. I hope it is helpful. I only do machine bindings now. 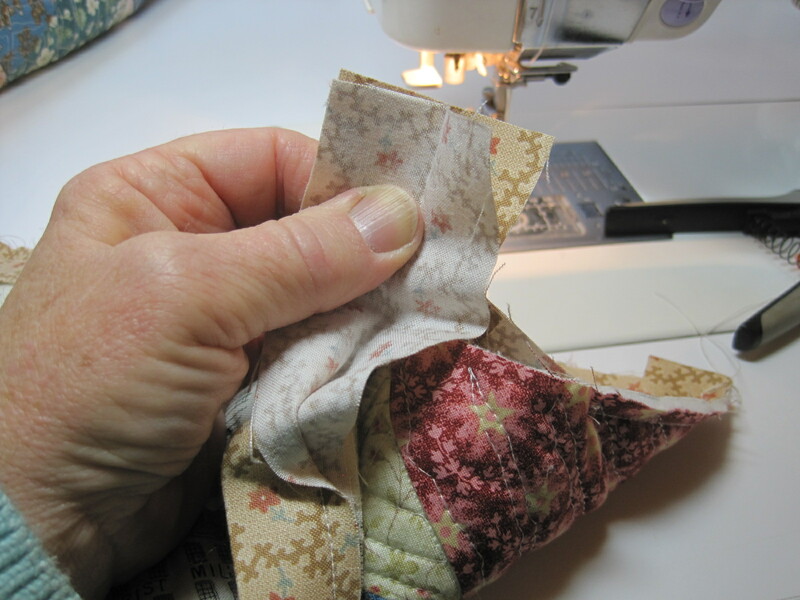 When I had carpal tunnel syndrome, the repeated pinching and grasping that was necessary to bind a quilt would make my hands go numb. Now that I’ve had the surgery and my hands are better, I still find that I like this way of binding better than doing it by hand. I always start with 2 inch strips of binding. 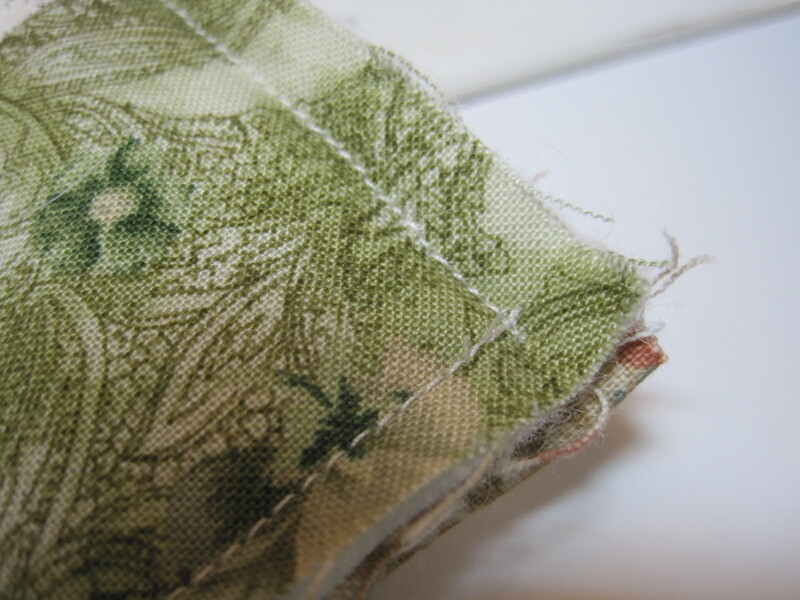 I do not cut my binding on the bias, and I do not sew it together on the bias. 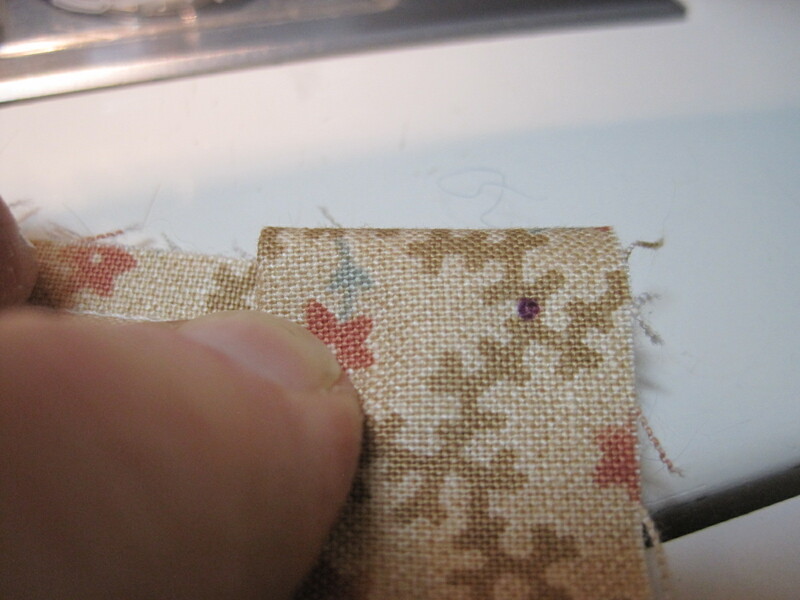 I sew the 2 inch strips together and then fold the entire length in half and iron it well. I iron the seams open. 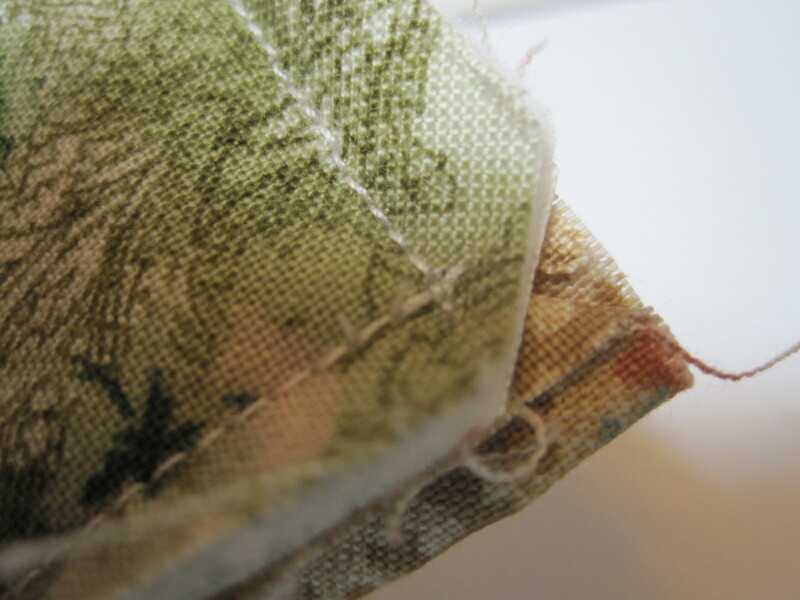 Sew the binding with the raw edges together to the BACK of the quilt. I use my 1/4 inch foot for this. 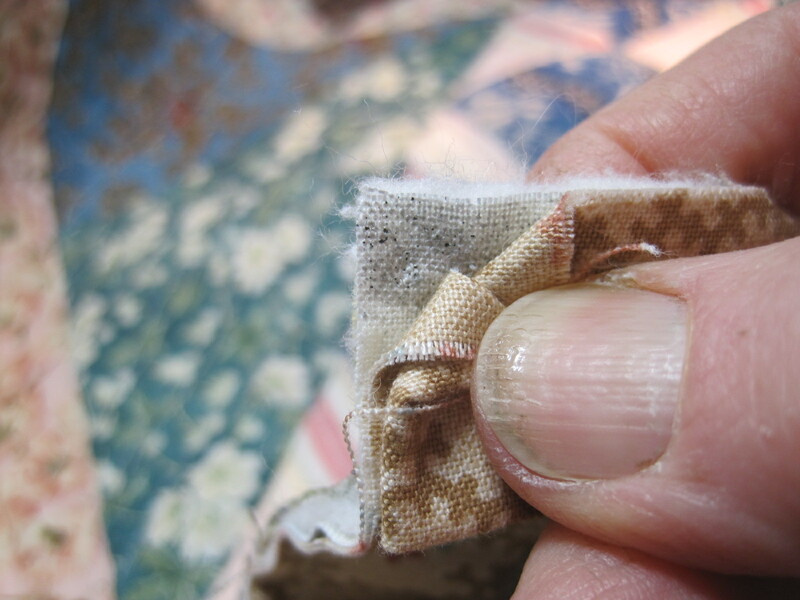 With 2 inch strips, I do not want more than a 1/4 inch seam. Start attaching the binding near the middle of the side, and leave at least a 6 inch tail. 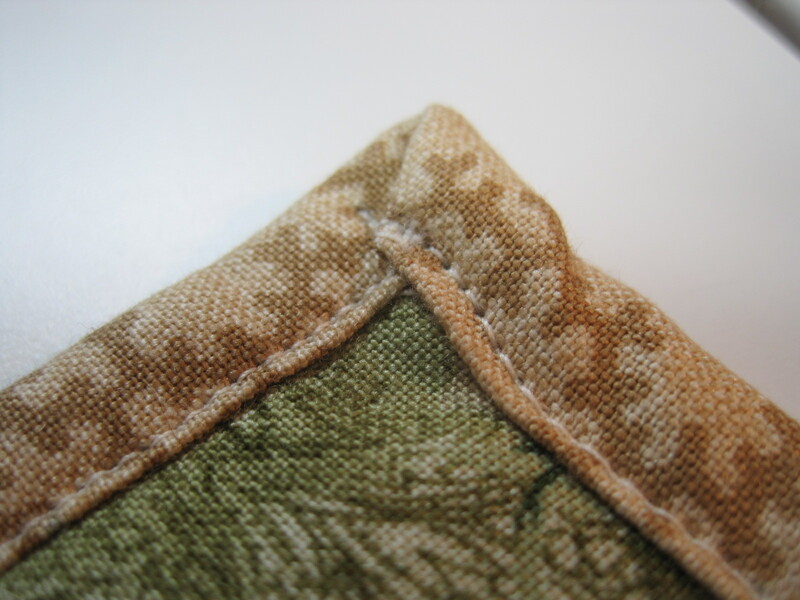 Turn the corner, and fold the binding straight up away from the quilt so that there is a 90 degree angle. Continue on and repeat these steps at each corner. 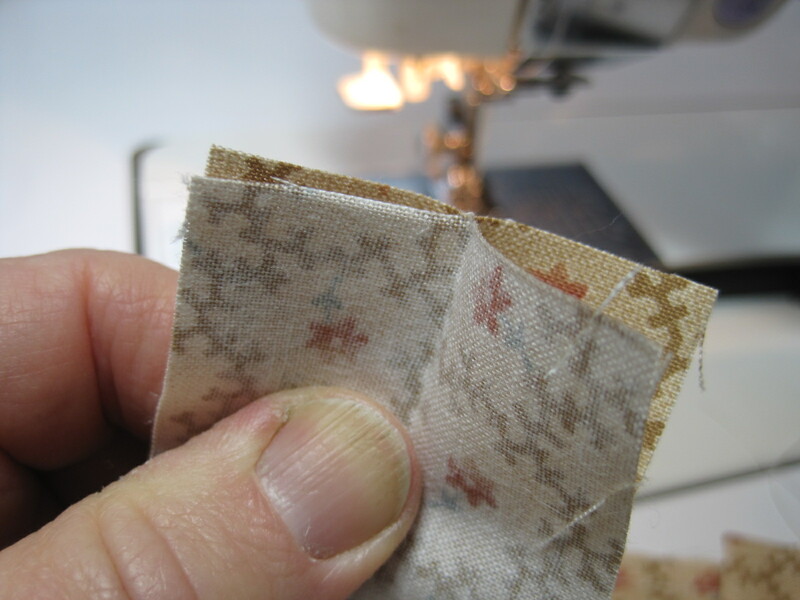 When you get to where you started, stop sewing at least 6 inches or more from the end. Cut thread. 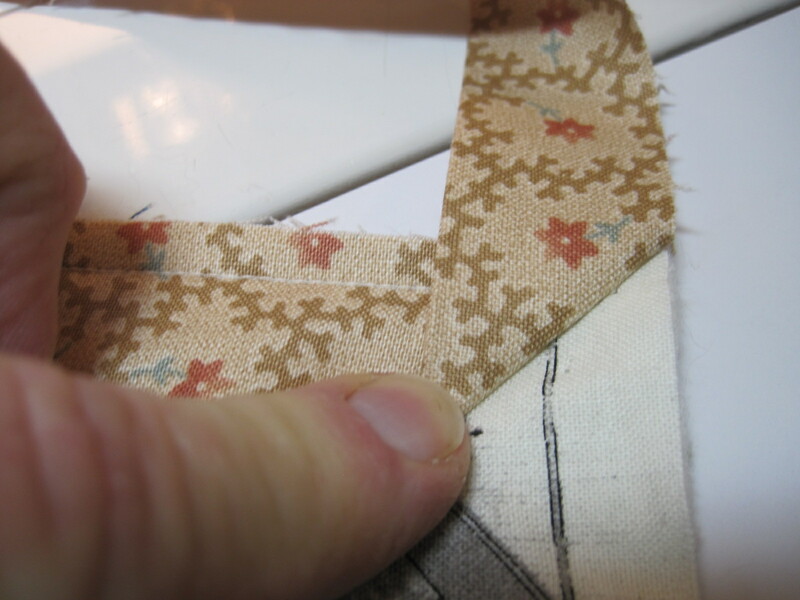 Overlap the two ends, keeping them straight along the edge of the quilt, with no gaps or extra tension, and cut them so that there is a 1/2 inch overlap. 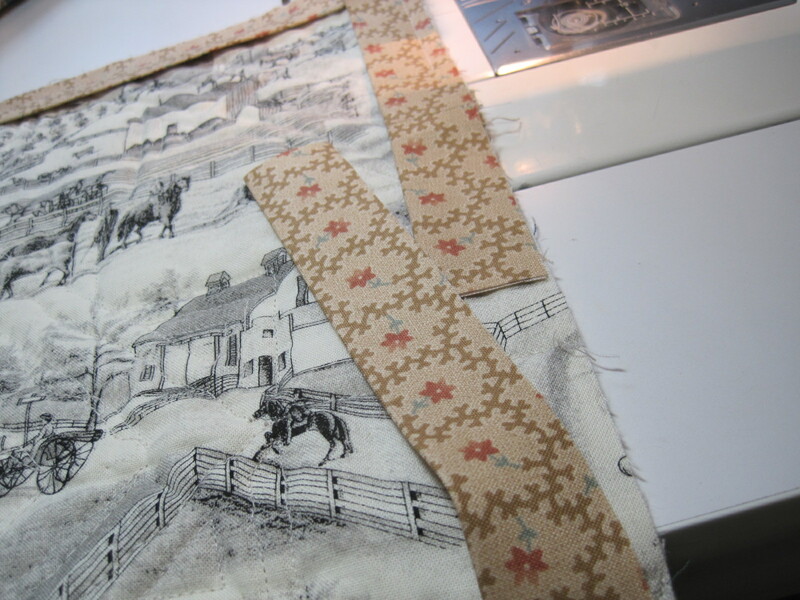 Sew them together, right sides together. This is always a little awkward. Here’s how it looks, with the quilt bunched up. 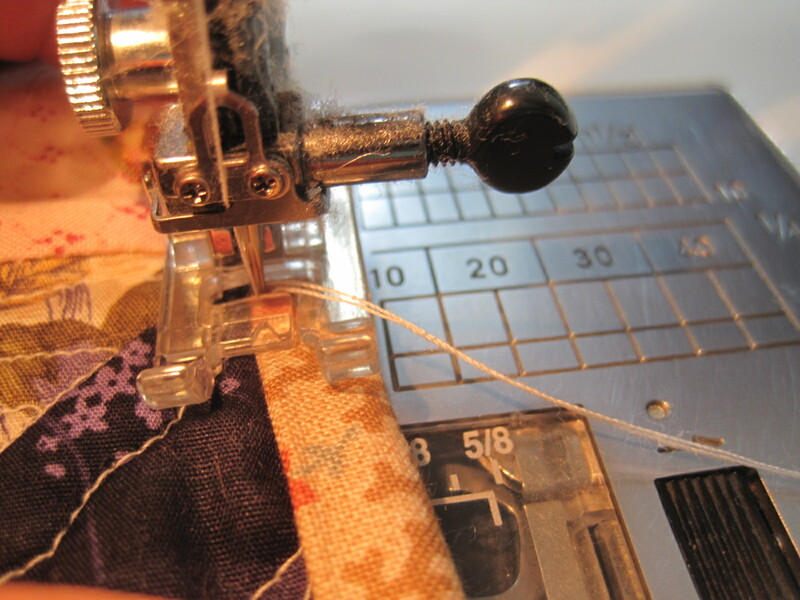 Now I change to a regular sewing foot. I don’t really want the 1/4 inch edge, because when I pull the binding to the front and attach it, it will be just a little bit more than 1/4 inch. 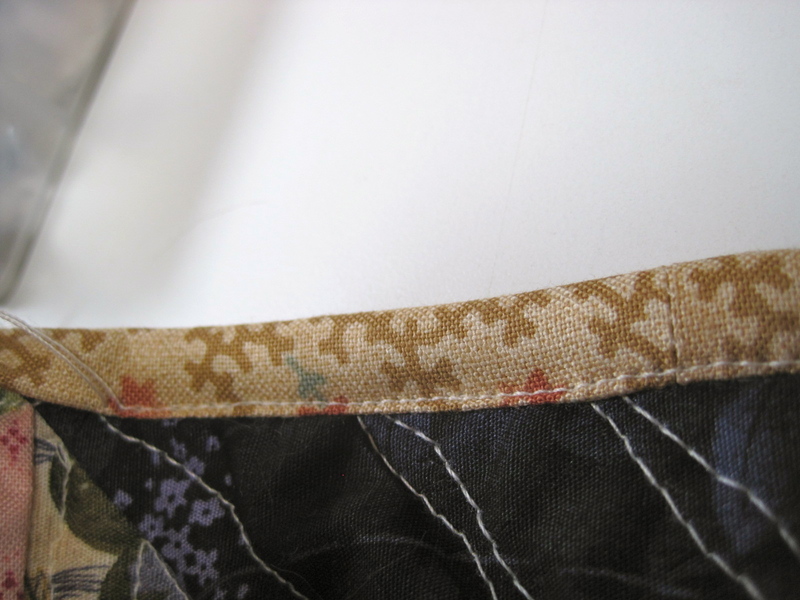 Pull the binding snuggly to the front of the quilt and start sewing just along the edge of the binding. 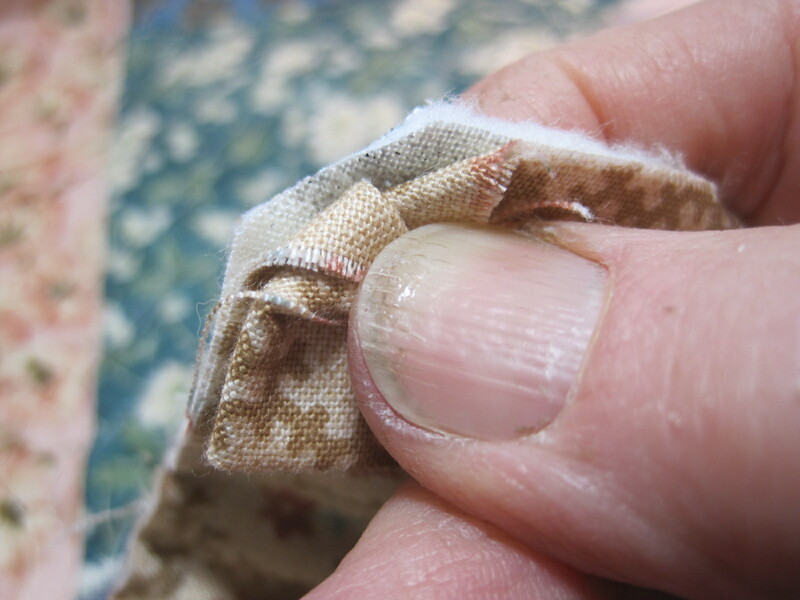 I take this part nice and slow, just pulling a couple of inches at a time and sewing slowly so that I keep my stitches close to the edge of the binding. Now, when you get to the corner on this side, it will seem rather bulky. There are quite a few layers of fabric and batting here. 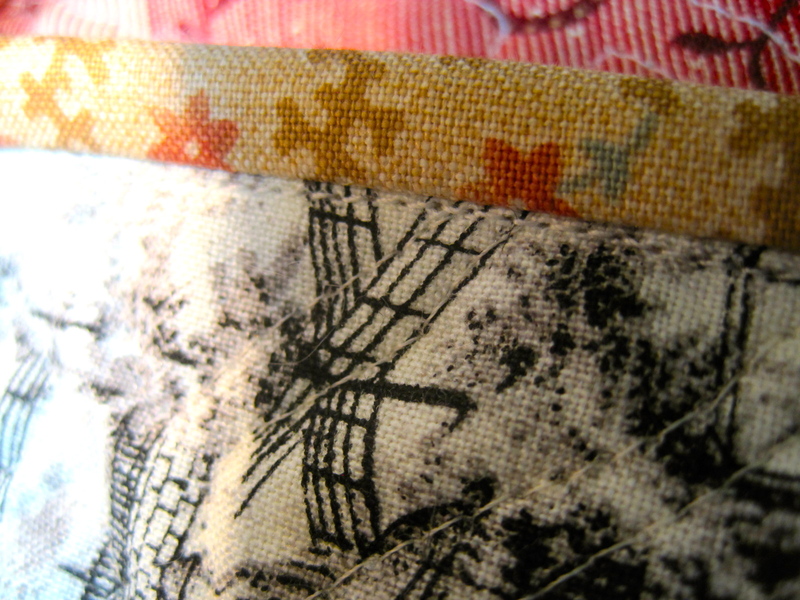 Carefully clip the corner of the QUILT (top, batting, and backing of quilt.) DO NOT clip the binding. Here is another view. I usually fold it back like this so I am certain that I am only clipping the quilt. Now continue on slowly toward the corner. 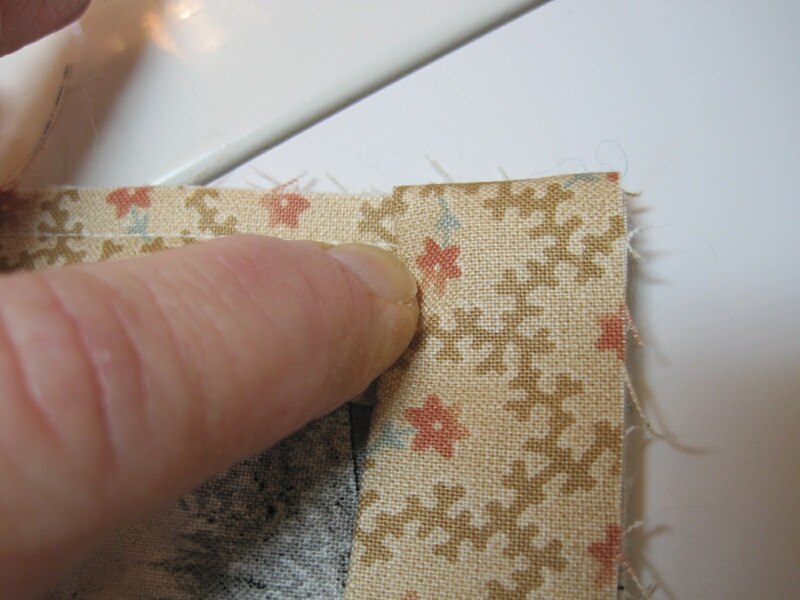 Fold the binding as neatly as you can in this 90 degree angle. Sew not quite to the edge, and take a few back stitches to secure. Cut your thread. 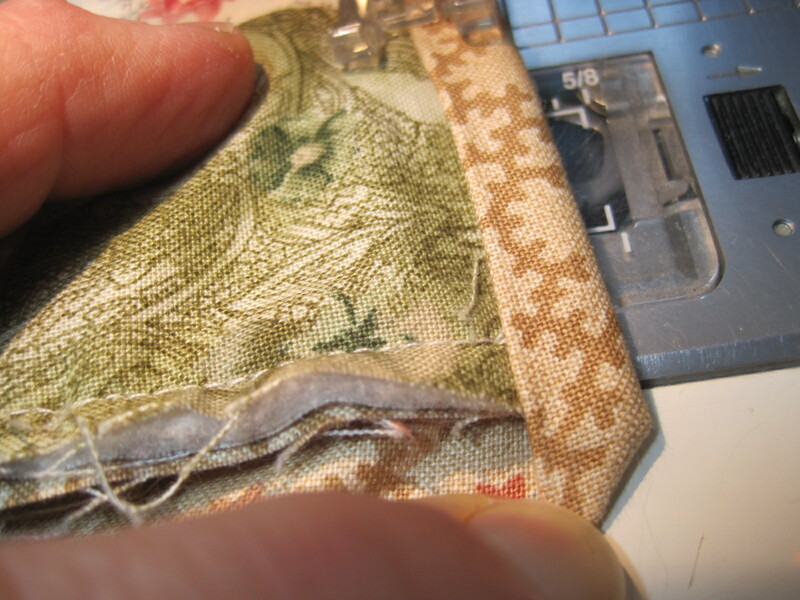 Fold the binding down at another 90 degree angle (approximately) and sew, again taking a few back stitches to secure. 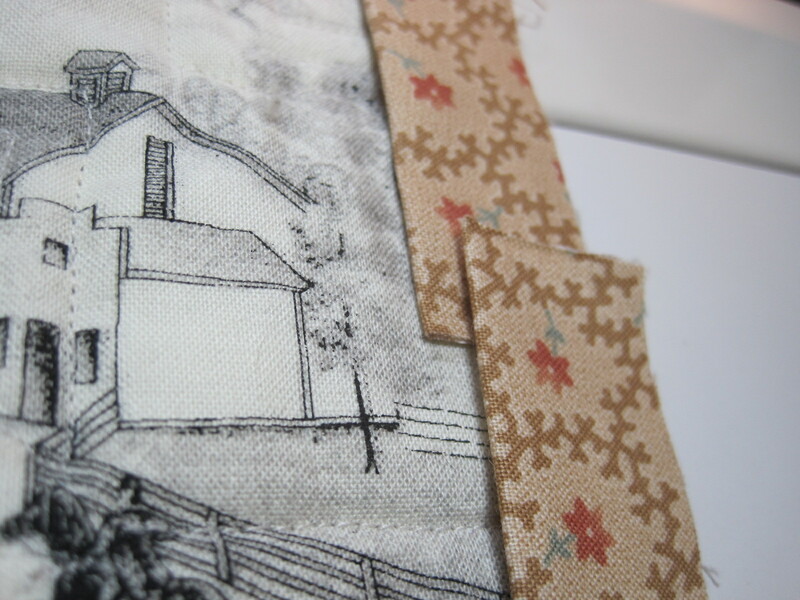 This is how the line of stitching from the front will look on the back side. 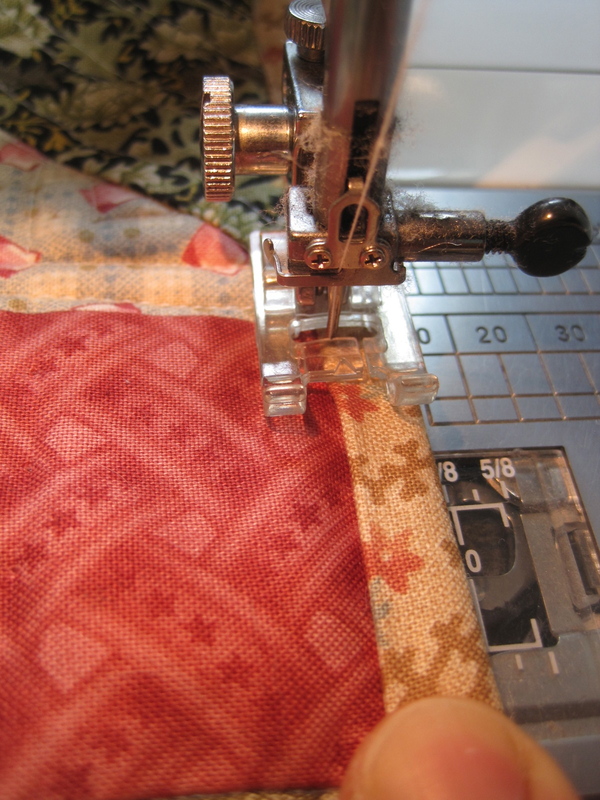 And that is how I put a machine binding on all of my quilts. Let me know if you need more explanation, or if anything is unclear, and I will try to explain it differently.